Northwestern State University President Dr. Jim Henderson was selected OCT. 6 in a unanimous vote of the Board of Supervisors of the University of Louisiana System to head the system that includes NSU and eight other institutions across the state. Henderson, whose name was the only one submitted for consideration by a search committee comprised of members of the board, will officially assume the presidency of the state’s largest higher education system on Jan. 1 of 2017. He will succeed former Louisiana Tech President Dr. Daniel Reneau, who has served as interim president of the system since Dr. Sandra Woodley resigned from the position in late 2015. He stated, “Part of my heart will always be with Northwestern and its people. But the system presidency will allow me to maintain a close association with my alma mater and the Natchitoches community and at the same time provide opportunities to create a positive impact on higher education statewide. One of the 20 largest higher education systems in the nation, the University of Louisiana System governs Northwestern State University, Louisiana Tech University, Grambling State University, University of Louisiana-Lafayette, University of New Orleans, Nicholls State University, University of Louisiana-Monroe, McNeese State University and Southeastern Louisiana University. Total enrollment of system schools is more than 90,000. Northwestern’s enrollment has increased by 9 percent since Henderson assumed the presidency. This fall’s gain of 7 percent from 9,179 to 9,819 was the largest numerical and percentage increase among University of Louisiana schools. Under Henderson’s leadership, the university has established numerous new and realigned market-responsive academic programs that better serve business and industry and graduates entering the workforce. His tenure at NSU has also been highlighted by enhanced activities and experiences for students, upgraded campus facilities, expanded marketing initiatives, innovative new recruitment programs and substantial increases in fund-raising and alumni engagement. Henderson has extensive experience in higher education and state government. He was chancellor of Bossier Parish Community College for nearly six years before becoming president of NSU. Enrollment at BPCC soared by 86 percent under his direction, and degree and certification completions increased by 90 percent. He served from 2005 to 2009 as Senior Vice-President for Career and Technical Education for the entire Louisiana Community and Technical College System. Enrollment in the system grew by 98 percent during that period. Henderson was Director of Administration and Workforce Development for the Louisiana Department of Labor from 2001 to 2005 and worked in the private sector in hotel management for 10 years before beginning his service in state government. A native of Shreveport, Henderson is a 1994 graduate of Northwestern with a bachelor’s degree in journalism and English. He earned a master’s degree in administration from the University of West Florida and a doctorate in management from the University of Maryland-University College. His wife Tonia is also a Northwestern graduate who has been engaged in a successful career as an executive in television advertising and sales. They have three children, Reagan, Nicholas and Alexander. Jim Henderson has been named a candidate for President of the University of Louisiana System. Henderson, who served as Chancellor of Bossier Parish Community College from 2009 to 2014 and has been President of Northwestern State University in Natchitoches since January 2015, will go before the University of Louisiana System Board of Supervisors Thursday morning for a public interview at a special meeting in Baton Rouge. He released a letter via e-mail Monday stating that he would “accept the presidency” if the board approves his nomination. If selected as the next president of the UL System, Henderson will take over from Dan Reneau, who has been interim president since December 2015 following Sandra Woodley’s resignation. This morning it was announced that I have been recommended by a search committee of the Board of Supervisors of the University of Louisiana System to become president of that system which governs Northwestern and eight other schools in the state. That recommendation will be considered by the full board at a meeting Thursday in Baton Rouge. I have agreed to accept the presidency if the board approves my nomination. This is to let you know that one of my highest priorities, if elected, would be to assist in every way possible in making this a positive and beneficial transition for Northwestern that would help assure the continued progress and momentum of the university that we all cherish. It is impossible for me to adequately express to each of you my appreciation for the role that you have played in creating this possibility for me to assume a position of expanded involvement in shaping the future of Northwestern and other schools in the University of Louisiana System. This university has extremely capable and gifted faculty and staff members. Your commitment over the past 21 months to raising Northwestern to higher levels of achievement and excellence helped create the recognition and attention that resulted in my nomination to this position. We are attracting and retaining students that are enhancing the reputation and image of the university. The loyalty and enthusiasm of our students and their support of the university was another factor in the board’s interest in perhaps having me involved in the leadership of the system. Northwestern, as I have stated many times, is blessed with some of the most knowledgeable and creative people in higher education in Louisiana and far beyond. The vast pool of talent and energy here will ensure the continued success of our school and my alma mater regardless of who is serving as president. Our students now and in the future will continue to benefit from your talents and commitment to excellence. 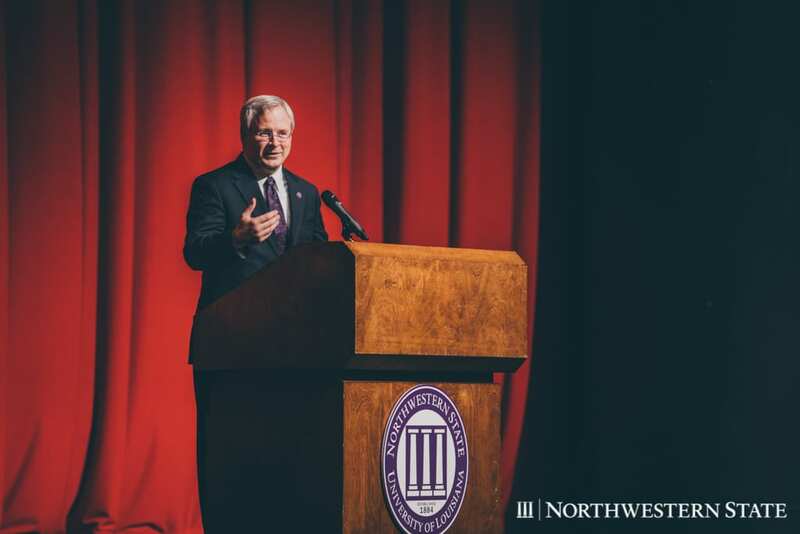 My continual and extensive interaction with students, faculty, staff, alumni, and others has made serving as Northwestern’s president an enjoyable and rewarding experience. Those relationships will continue whether I am here or in another position. If the board selects me to serve as system president, that would provide additional energy in our mutual efforts to improve and enrich Northwestern, just as we should work to make every university in Louisiana as strong and effective as possible. In this time of immense challenge and limitless opportunity for higher education, effective leadership for the universities of Louisiana at the system level is paramount. Thank you for your ongoing support and assistance and for making our association with Northwestern, whether it continues as it is or in a different capacity, so gratifying and enjoyable for me, Tonia, and our family. Sincerely and Fork ‘em Demons!